A panel of experts sat down with RT Thursday to analyze the first interview Edward Snowden gave to US media, a conversation that touched on the NSA whistleblower's motivation to leak classified documents and how his actions have been misrepresented since. Norman Solomon, director of the Institute for Public Accuracy, attorney Bruce Fine, and Jesselyn Radack, director of national security and human rights at the Government Accountability Project and one of Snowden's attorneys, described Snowden as a hero who put his life on the line to expose abuses committed by the surveillance state. Current and former NSA officials have blasted Snowden for supposedly failing to take his complaints to his supervisors and instead leak so much information to the press. The US government published documents one day after Snowden's interview with NBC, though, indicating that the former contractor did, in fact, communicate some of his concerns to NSA bosses. The panel was asked whether the new information, and the notion that it proved part of Snowden's story, helped improve his legal standing. Bruce Fine: It certainly does, it shows that he wasn't reckless and immediately went to Hong Kong and disclosed the information but that he understood the rules of the game and exhausted them without result and it gives credence to his rendition and narrative that he is not the first to tell the whole story. Tom Drake basically confronted the same problem and that has repeated through the whistleblower regime. It is not the case that whistleblowers characteristically leak to go public and not go internally. They are not reckless people they are conscientious and I can state that I think Mr. Snowden's demeanor gives special strength to his narrative. There's nothing that looks exaggerated or frantic and he doesn't use words that display antipathy towards the United States or others and that, as I said, strengthens the credibility of the entire story. Jesselyn Radack: I was really glad that America was able to hear more about his background, including being undercover at both the CIA and NSA and also his attempts to go through channels internally with the facts that NBC was able to get the NSA to admit to. That argument about not going through proper channels has been a thread throughout the debate throughout the last year so I thought that was really significant that he talked about how his attempts had been thwarted and really amounted to nothing. Government officials and an alarming number of media pundits have repeatedly asserted that the vast trove of documents Snowden turned over have done serious harm to US counter-terrorism efforts abroad. 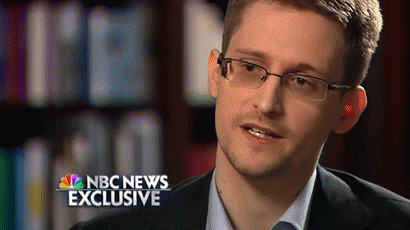 Snowden, in his conversation with NBC's Brian Williams, said that such claims have never gone past vague generalities. Norman Solomon: For one thing there's no evidence that any harm has come from the revelations due to the work of Edward Snowden. Secondly, the huge damage that is done by secrecy vastly overwhelms even the claims of damage that have come from top US officials in the cases of Edward Snowden as well as Bradley Manning, now Chelsea Manning. I think we should also recall as a footnote that as a senator Mr. Kerry voted for the invasion of Iraq, an invasion based on lies, and if we had whistleblowers with courage based in a similar space inside the government as Edward Snowden then perhaps the invasion of Iraq could've been avoided. So I think that one of the problems we're getting with the demagoguery of Secretary of state Kerry right now is that the real threats in terms of public information from the government for the safety and well-being of Americans and others around the world come from a failure to disclose information to the public rather than the other way around. It is for those reasons, the trio of experts told RT, that the public should be skeptical of the NSA's ongoing claims that Snowden is in some way lying or otherwise distorting the reality of the situation. Radack: Throughout this whole narrative over the last year one person has been consistently telling the truth and that's Edward Snowden and a number of people have been consistently lying and those are people associated with NSA and the intelligence communities. Moreover, pretty much every whistleblower in this area is smeared with the idea that they have harmed national security, that Tom Drake was going to have the blood of soldiers on his hands. Yet in Chelsea Manning's case, for example, when it came time to produce a damage assessment during the court martial the US was unable to do so. If you carefully parse the words that it talks about when it talks about this damage usually they couch it in terms of "it might cause some damage in the future." Again, it's impossible to prove a negative, so by saying these assertions without anything to back up it I don't take them at face value at all. Solomon: Before Edward Snowden stepped forward the Justice Department went to the Supreme Court and falsely asserted that the ACLU and other groups had no standing because there was no reason to believe that they were being spied on and yet we now know that those groups and millions of other groups and individuals were being surveilled and yet at this moment the Justice Department has continued to fail to do their legal duty and go back to the US Supreme Court and correct the record in a 5-4 case that the Obama administration won partly on the basis of their lies. Fine: I think you also have to ask about motives: What would benefit Edward Snowden if he gave and shared this information with the Russians? He clearly would like to leave, he never had any intent to arrive there in any event, the revocation of the passport and blockage of any entry into a Latin American country kept him there. What's his motive to lie about this? How does this benefit him? And think on the contrary, how it benefits all his detractors to make up or throw these insinuations out there.